I have been a Ghost Rider fan since I was introduce to him in the early 90’s. Yes I know it’s hard to hear but I was first introduced to the Danny Ketch Version of Ghost Rider which then lead on to the Rising Sons issues where we would have the Marvel Monsters seem to come together into their own part of the Marvel U. As you’ll notice from some of the upcoming posts I do have a few commissions of various Rising Sons characters event though I don’t get much marvel at all these days. 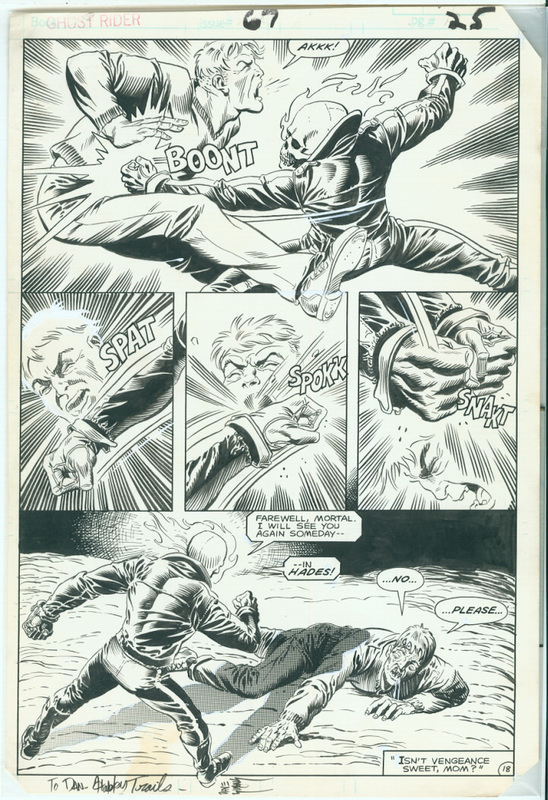 This image you can see below is my own Ghost Rider page which is Page 18 Issue 65 of the 70’s run of the title. This would be the most expensive page I have bought which about 3 years ago was $350US. This is probably one of 3 pages I own that I will never sell. From ComicbookDB the artist is Jack Sparling and it’s an issue that I haven’t been able to find anywhere.